Association of content and Q&As with time, mastery and skills levels to build customizable user defined study plans. This particular study-plan wizard enables the students to create their own work schedule, according to exam board syllabus and the time they have available. It will give users detailed reports on how they are doing, any time they want. The key to effective learning is to set up a study plan that the students will be able to stick to. 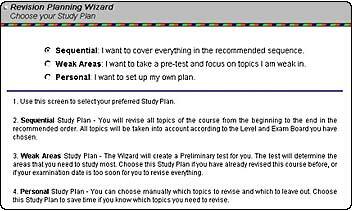 The study-plan wizard will take them through a clear, step by step sequence, to set up their own personalised plan. The content can be adapted to your Exam Board, Level, etc. You can study everything or revise only your weak areas. You can have tests and progress reports as often as you like. ...and define study days between these dates using a calendar.